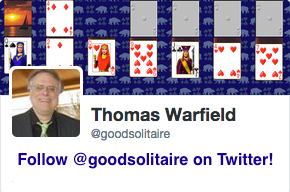 Screen shot of the game Swiss Patience from Pretty Good Solitaire. 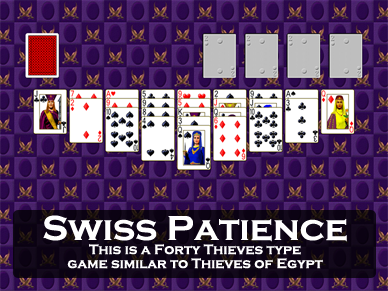 Swiss Patience is a one deck Forty Thieves type game. There are four foundation piles. These piles are to be bult up in suit from Two to King and then to Ace. When all of the cards are moved here, the game is won. There are nine tableau piles. These piles are built down by alternate color. Groups of cards in sequence down by alternate color may be moved as a unit. Spaces may be filled only by Aces. 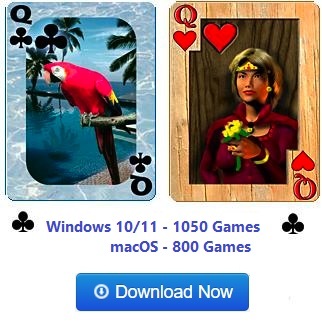 At the start of the game one card is dealt to the first pile, two to the 2nd, three to the 3rd, four to the 4th, five to the 5th, four to the 6th, three to the 7th, two to the 8th, and one to the 9th. The remainder of the card form a stock. Clicking on the stock deals one card to each tableau pile. There are no redeals. 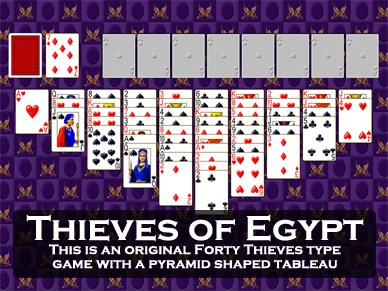 Swiss Patience has a pyramid shaped tableau like Thieves of Egypt. An average player can win about 50% of the time.